Welcome to Vaughan Jones Socket Screws Limited. 100% manufacturer of special screws and turned parts. We hold approval to ISO:9001 2015 as well as Ministry of Defence AQAP4. Established for over 50 years, Vaughan Jones is one of the country's leading manufacturers of special fasteners and turned parts. We hold approval to ISO 9001:2015. Certificate number FM00028. Investment in the latest technology has allowed us to enhance our product range. 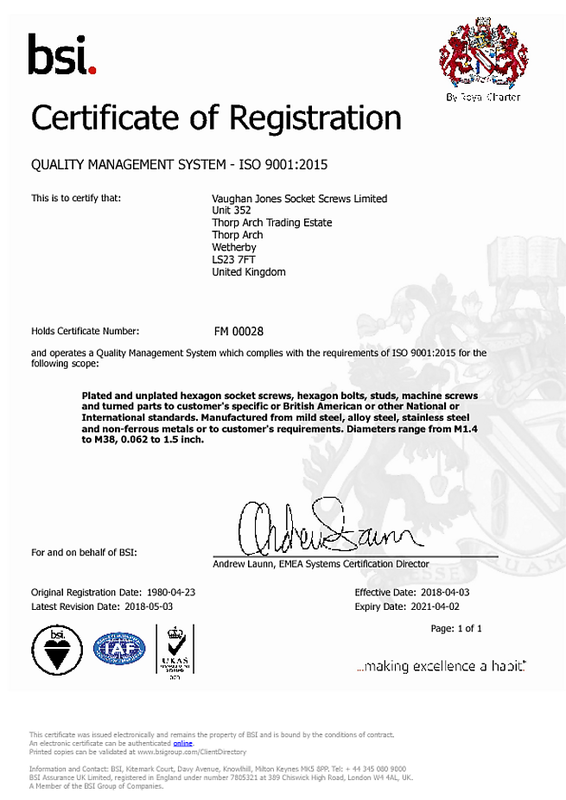 Vaughan Jones has achieved approval to the 2015 revision of ISO 9001. This helps to assure new and existing customers that we are committed to supplying high quality product whilst achieving continual improvement and growth as a business. See above to view or download our approval certificate. We have installed yet another new Star machine, in the form of a new SR20J With 4 meter bar feeder which arrived this month and is fully installed. This machine replaces the very first machine purchased in 2001, which was part exchanged. The new machine is more capable and has faster rapids than the original machine, also being new is more precise. WE HAVE INSTALLED A FURTHER STAR SR 10 J MACHINE. Due to demand from our customers for the smaller sizes we purchased a new Star SR10J from Star Micronics. Having purchased the first of this type of machine, off the stand at the Mach exhibition at the N.E.C in 2006, the company decided to double up with this new very quick machine. A brand new Citizen L20 VIII, 8 axis CNC lathe was installed this month. This machine compliments the exsisting Star machines. We are proud to announce the purchase of a brand new Star SR10 from the Star Micronics Stand at MACH 2006. The machine has a maximum bar capacity of 10mm, and has 35 metre rapids to ensure tools get to the cutting positions as quickly as possible. This new purchase compliments our exsisting 2- 20mm diameter machines and the 32mm capacity machine. Our new state-of-the-art Swiss-type sliding head automatic CNC lathe is now fully operational. The bar-feed has been laser-aligned, the necessary filters installed, the viewing panel replaced in order to cope with the high pressure coolant system installed, and all the necessary tooling has been installed and tested. Vaughan Jones' engineers have also completed their extensive training on the new machine, and the first turned parts are due to be produced on the machine by April 15th. The new machine is able to produce even more specialist parts Parts with internal threads, off-centre hole drilling, parts with angled holes, and parts that require drilling on the end face are now possible. Several features on the new machine, such as offset tool-setting and balanced turning, will enable the company to increase its capability whilst maintaining its reputation for quality. We have ordered our 3rd New machine from Star Micronics UK for delivery in March 2005. The 32mm capacity machine increases the size we can handle on these multi-function mill/turn machines with the new machine having a capabilty of 80 tools for one hit manufacturing.The new machine has been ordered with long parts facility, magazine bar feeder, swarf conveyor and high pressure coolant, all to assist with production on 24/7 basis, some lights out. This machine builds on our earlier heavy investment in state of the art machinery to service our customers in the manner they are becoming accustomed to. We have purchased a brand new profile projector from Mitutoyo, complete with QM Data and optieye edge sensor. This is a state of the art machine for use by setters and our inspection department.